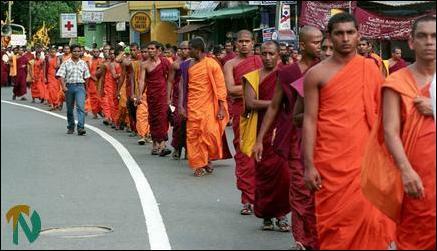 Leaders of the Marxist and Sinhala Nationalist Janatha Vimukthi Peramuna (JVP), the Sri Lanka Freedom Party (SLFP), Buddhist monks and thousands of party activists and supporters Friday held a demonstration march in downtown Colombo under the Patriotic National Movement (PNM) banner, supporting President Chadrika Kumaratunga’s decision to take over key ministries of the United National Front government in the wake of the submission of the Interim Self Governing Authority (ISGA) proposals by the Liberation Tigers of Tamil Eelam, sources said. 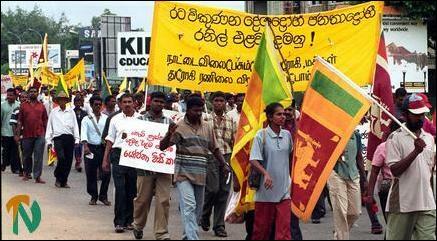 The demonstration started from the Sri Jayawardenapura Parliament Juntion and head through Borella Juntion to Borella Cambal parck and held demonstratioly. The JVP’s propaganda secretary, Wimal Weerawansa, Ven. 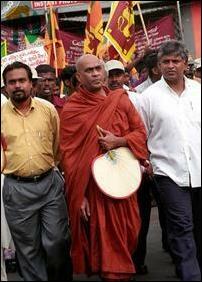 Elle Gunawanse Thera, Former Sri Lankan cricket star, Arjuna Ranatunge, and other JVP parliamentarian marched under the banner of the Patriotic National Movement. Supporters shouted slogans and said that the President took over the three cabinet ministries under her control to safeguard the country’s security. 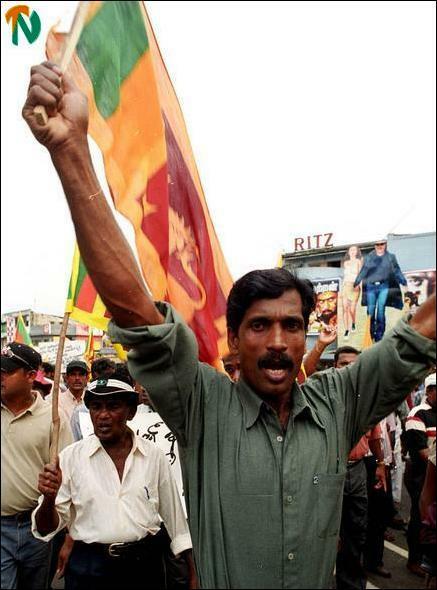 A PNM supporter holding the Sri Lankan flag aloft and marching.